The other day I was starving. I mean seriously needing to eat as fast as I possibly could or else I would die of starvation <-- dramatic much? I had been working all day so darn hard that before I knew it, it was WAY later than lunch time and my measly piece of toast I had for breakfast 3546 hours earlier was very much consumed into my body. I needed nourishment and super quick. I hate cooking for myself. HATE. I've been known to make lunch consist of dried cereal (no milk) and a piece of dried fruit or two if that means I don't have to pitifully cook something for myself and then eat...by myself. Weird? Yeah, it is...I know. My husband gets on my case about this all the time (as he should) but I can't help it! Come lunch time if there aren't left overs in the fridge, it's stale Joe's O's to the rescue! SoOOoOoo to my delight this lovely day there WERE leftovers! Errr....parts of leftovers. There wasn't a half a dinner waiting for me (sadly) but instead a little dish of leftover cooked black rice from the night before. And a handful of spinach. And 6 grape tomatoes. And the littlest portion of left over tofu from smoothie makings days before. You get what I'm saying. OoOOOOo wait! Let me tell you about black rice!!! I've come to the realization that there is definitely a hierarchy of rice. At the bottom is plain ol white rice. Sorry if it's your favorite. To me...it's the Wonder Bread of rice- yummy but completely lacking in the nutrition department. It's like eating way yummier pieces of paper. That's how much nutrition you're getting. Next up, wild rice. 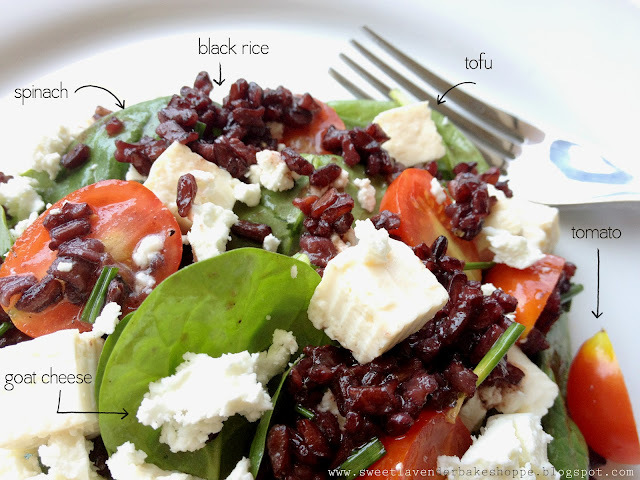 Weird thing- wild rice isn't even technically rice at all! GASP! It's actually a mix of grasses! But it's called "rice" so it goes into the hierarchy near the bottom. Next up, brown rice. YUM! We love brown rice!!! This has been at the top of my list for-EVA...It's yummy and packed full of fiber and yummy and has more texture than white rice and yummy and stuff! <---Best composed sentence I've ever written to date. BUT THEN I STUMBLED UPON (not to be confused with this) black freaking rice (actually it's almost purple in color, but let's not be so technical). Have you guys had this stuff? It's like the King of rices. It's super nutty in flavor and the texture is just fantastical (I'm a texture person). It's also PACKED full of all things good for you! Wow....I haven't made an outline like that since college. Who have I become? Who am I kidding...outlines rock! Let's all make more outlines. They're easy to read, understand....and look pretty nifty too. So there I was making outlines out of anything I could and needing some lunch because I was a hungry hungry hippo when I stumbled on black rice and leftovers and unicorns and such. Jeez, wrap it up Christina. Basically what I am trying to say is this "hates to cook for herself only" gal whipped up this hearty lunch in no time flat and was very satisfied :) It really did hit the spot- this one plate wonder had my fiber, fat, vitamins, protein, carbs, veggies, and technically fruit (ahem tomatoes are a fruit). Plus there was a little leftover for snackage later on... WIN! In a bowl add your lemon juice, chives, honey, salt and pepper. Whisk together. While continuing to whisk, slowly add your olive oil. Once mixture is thoroughly combined, set aside and prepare your salad. Like stated in the beginning, this recipe is enough for one hearty dinner portion, but can just as easily serve two for lunch. Needing a larger recipe? No problem! This recipe can definitely be doubled or tripled even! 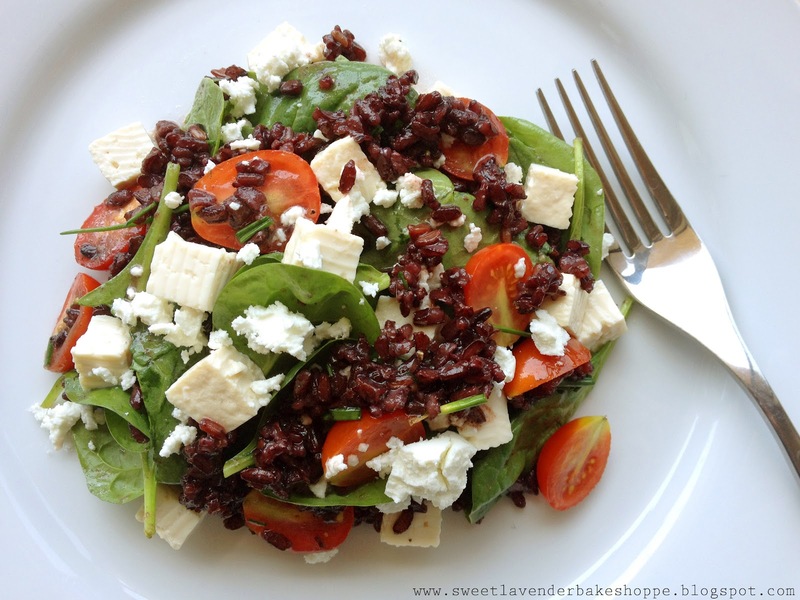 Don't forget to watch how much salt you add to your dressing- remember there is goat cheese in the salad which does have a bit of saltiness. Needing to make this dinner VEGAN? Just omit the goat cheese altogether and you're good to go! I recommend making this salad right before you're ready to serve. If you need to make in advance, just toss together the spinach, tomatoes, rice, and tofu together and place in fridge until you're ready to serve. Then toss in your goat cheese and dressing and plate up! My favorite part about your blog is that your personality just shines through each post. The next time I am in Cali - we are getting together. 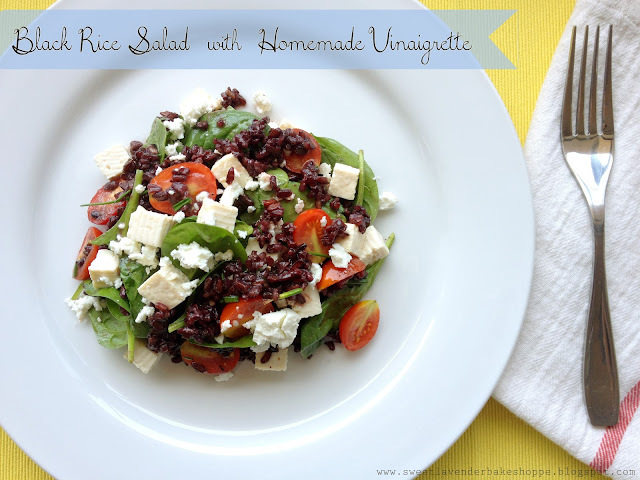 Also, love the recipe and I'm going to have to find black rice!! I have been thinking about you (and a few other really good blogging friends that I've made)! I just hope so much that there comes a time or way I can get together with you all and hang out! You've all come to be actual friends to me!! PLEASE DO see us next time you're in Cali! I would LOVE that! MMMMM this look absolutely delish. I've never cooked with black rice but I'll have to now!